Like.. what did I just witness i can't tell. I don't understand how the writers were able stretch it so long. 1. They never told us whom did tae so liked since he refused to be scared of women and there was no evidence that he liked yeo wool bt no clarification was given or maybe the writers forgot about it. 2. Yeo wool and gon hanged so much together but there was no spark b/w them thankfully I couldn't have dealt with a love triangle. But she had no skills like gon all I could see is her moving her leg to kick people especially his boyfriend. 3. Then suddenly there were elements like ninjas who can multiply and even hypnotize too but those were done only for an episode. What a waste of talent Coz they fought like ordinary people in other episodes as if they were searching for gu family book too by not using their true powers like kang chi. ..
4. Then there comes a story b/w the lead actor's parents which was somehow more romantic than the lead. Now when seo hwa (mother) returned after 20 yrs she was a completely different person while jo gwan only got some of his beard white. Yet after 20 yrs he was able to recognize seo hwa who I guess got a plastic surgery in Japan. 5. The guy seemed to be More attracted towards Chung ju who treated him like dirt than yeo wool. I see their chemistry more better than yeo wool who would just find way to stick around him and those forced scenes of them showing playing and laughing together and yet no objections raised by gon who would otherwise get jealous and stop kang chi to get close to yeo wool or yeo wools father. 6. How come our smart intelligent gomiho was not able to see that sir dam was not sir but a lady. Women and men have different odour even dogs can tell that how our mystical beast missed that point? 7. Funniest part was when they try to kidnap yeo wool and covered her head with a black cloth in the forest. Suddenly gon appears and couldnt recognise it was her lady while a drunk man who lost almost 70% of his senses was able to see that they're carrying the pretty boy and even remembers the place where the ninjas took her. 8. Last but not the least what was Gu family book about? Was kang chi suppose to import it because it was unavailable in his country at that time. If not what,can someone explain why was the dramaa really named that. 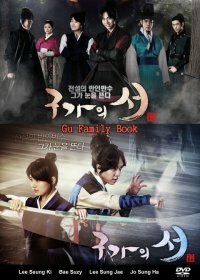 Conclusion- Apart from these funny elements the story was interesting but a bit long, like 24 episodes were really Not needed until the end where I found about the relevancy of the title of the drma where my eyes were stick till the end of drama to see the gu family book like a wife waiting for his husband to come. But it turns out like the wife had some mental disorder and that her husband would never come because he doesn't exist. Lol. I enjoyed the role of our villain jo gwan woon. He really made me hate him no matter how hard I try. His acting was really very convincing.